Redesign your living room with this season’s hottest home decor selections all for a great price. Between Zara Home’s Mid Season Sale, to West Elm’s price slashing on furniture and Crate and Barrel’s Get Cozy Sale they’ve got everything you need to upgrade your living room this fall and at the right price. From stylish and functional coffee tables to chic accent tables, and comfy poufs and ottomans, you can instantly transform your space with just a few pieces that all happen to be on sale right now. Don’t waste any time and shop these savings today. 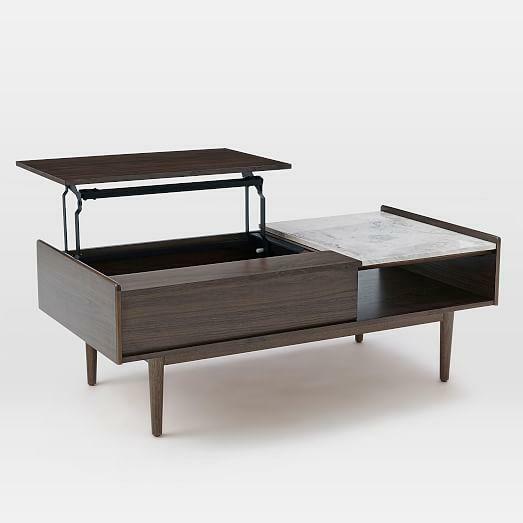 This multi-tasking coffee table is perfect for a small space storage solution. To the naked eye this coffee table is just a chic mix of dark wood and marble and is purely decorative, but it can do so much more. The dark stained eucalyptus wood table top pops open to reveal storage space to conceal everything from remotes to magazines. The pop-up also doubles as a table top so your couch can transform into a workstation or counter in seconds. The marble slab on the opposite side is the perfect surface for testing out your coffee table decorating skills, and the open shelf underneath is great for showing off your latest reads. For the perfect balance of functional and fabulous look no further than this coffee table. 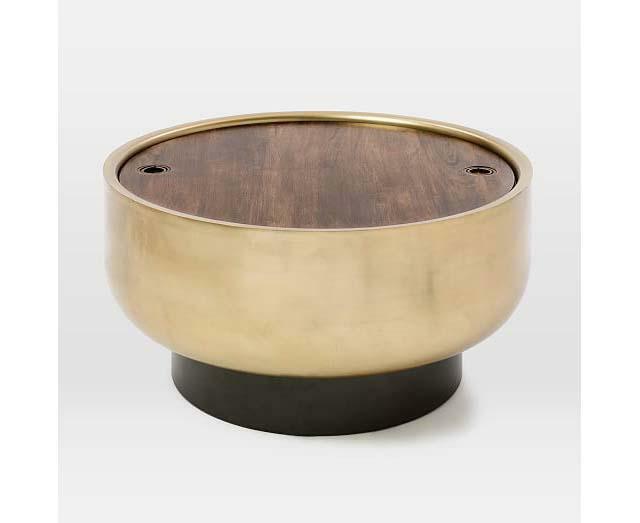 The metal basin’s antique brass and bronze finish instantly create a glamorous centerpiece for your living room. Its contrast with the mango wood top makes it perfect for any design style whether it be formal or casual. The drum’s metallic finish can inform your tabletop decor choices. Brass candle holders and vases will pop on the wood top. Beyond being a visual point in the room, this coffee table is full of storage space. Using the finger cutouts, remove the tabletop to reveal storage for all your throws and pillows. Keep all of your favorite items on display with this coffee table. Use the glass top as a display case to show off your expert-level coffee table styling skills. You can create a story with different books and trinkets all under the tabletop while keeping the surface free and clear to use. 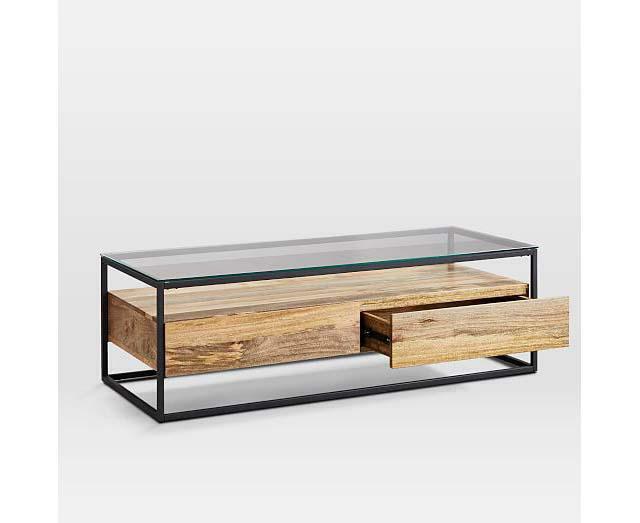 The contrast of the glass top, raw mango wood, and metal frame is a perfect combination for a contemporary living room. This table also allows you to have all the glamour on top, and some functionality at the bottom as the wood base has two drawers for storage.